As many of you know, here in America, particularly on the East coast, we've had a brutal Winter and a less-than warm beginning to spring so far. If your hands are showing the effects of the dry air, cold temps and frigid wind (consistently dry, flaking, broken nails, cracked skin), even after using your usual hand cream, Avene has a new product to help. 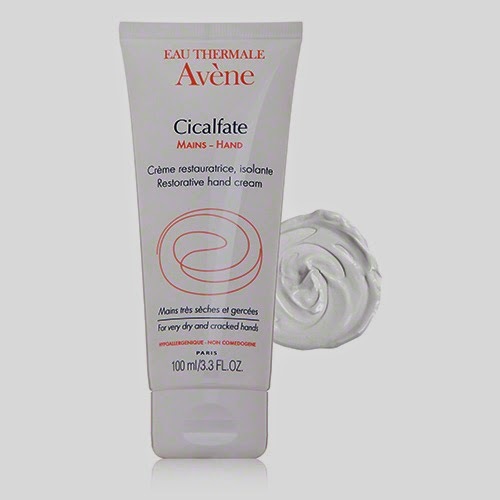 Avene's Cicalfate Restorative Hand Cream is rich and creamy in texture, but was completely absorbed in a few seconds on my drier than normal hands right now. I loved how easy it was to spread across my hands and especially my nails/cuticles and hydrate them fully and deeply. This hand cream, like all of the Avene line, is made with the Avene Thermal Spring Water and well as two powerful, effective ingredients : Sucralfate and Glycerin, which protect, repair and hydrate the skin specifically on your hands. your carry on before a long flight with drying air. It's also a must have when giving yourself an at home manicure during the hand massage step. I recommend keeping it in your bag, and at the office as well for reapplication. *This product was provided courtesy of Avene PR for reviewing purposes.